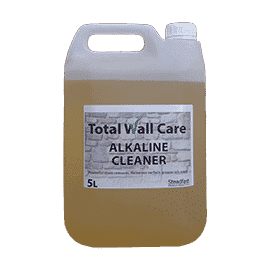 Total Wall Care Alkaline Cleaner is a strong, water based, alkaline cleaner for compact carbonate stone. To remove the surface patina caused by pollution on carbonate matrix materials. It effectively removes grease and oily substances. stones. It attacks aluminium and mattifies paints. It is also effective on extremely porous surfaces, such as cellular, vuggy stones and “unfilled” travertine. Can be used neat or diluted to a maximum ratio of 1 part cleaner to 4 parts water. 0.1 – 0.3 l/m² depending on the substrate type and amount of dirt.